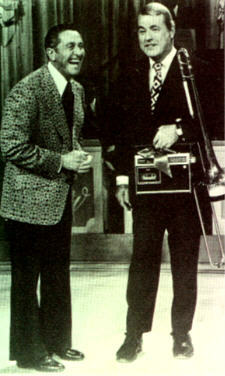 Barney Liddell was a trombone player on the Lawrence Welk Show from 1948 to 1982. Liddell was born and raised in Gary, Indiana, and began playing the Trombone at Lou Wallace High School. He had aspirations to become the next Jimmy Dorsey on the alto sax but found that the high school band was out of saxophones. Second choice was the trumpet. But there were no trumpets either. The only instrument available at the time, was the trombone. He found to his amazement, that the trombone was a natural for him. Since then, he has played with established jazz notables Sid Catlett, Billy Holiday, J.C. Higginbotham, Red Allen and Tony Scott's Quintet. While performing with Elliott Lawrence's band, Lawrence Welk heard him, liked his style, and provided an opening for the young trombonist in February of 1948. And, thus began his long career as the trombonist for The Lawrence Welk Show. Lawrence Welk has said: "Barney is one of the finest men, with one of the biggest hearts I've ever known." Liddell passed away on May 5, 2003 at the age of 81 and is survived by his wife, Elaine Liddell; children, Patrick, John and Terrence Liddell, Susan Anderson and Rachel Liddell; six grandchildren; and one great-grandchild.